Collage Wreath Template from Creative Memories is AWESOME! Hi friends! Noreen Smith from OrganizedandCreativeMom.com here on the CSM blog today sharing some tips on using a fantastic tool from Creative Memories – the Collage Wreath Recipe Template! This is the latest in a series of wonderful templates that can really take your layouts to the next level! The mylar template can be used over and over again to create a wide variety of scrapbook pages by rotating the stencil and/or flipping it to the other side, and you can customize each layout by choosing which the of traceable elements you want to feature in your layout. Simply place the template on top of patterned paper or cardstock, trace the shapes you want with a pencil, cut them out and arrange them on your album page or cardstock. I created a few different variations to show you just how versatile this tool is! In this first layout, I wanted to use all the fun rays that emanate out from the large circle, so I traced them onto three different patterned papers from the new Blend & Bloom Green Paper Pack. I decided to leave a space between the rays and the circles, so I traced only two circles. I found that after tracing and cutting out my shapes, it was easiest to adhere the template itself to my Goldenrod Cardstock base with Repositionable Adhesive…that way I could adhere all my cut-out pieces into the right position without constantly readjusting the template. Once my base was finished, I added a 4” x 6” photo matted on Evergreen Cardstock, some coordinating Blend & Bloom Embellishments, and Greenery, and journaled on some scraps of White Cardstock. So bright and cheery! Next, I wanted to try my hand at making a gorgeous wreath by layering the Blend & Bloom Foiled Flower Embellishments and more of the Laser Cut Greenery over the shapes. I opted to keep the background simple by grouping the individual rays together into one shape, and only tracing one large circle onto papers from the Blend & Bloom Pink Paper Pack. After adhering them onto a White Cardstock base I began the layering process, placing the larger greenery pieces along the edge of the circle, cutting some of the greenery into smaller pieces, and finally layering the die-cuts and foiled flowers into clusters with Foam Squares. So much texture! For the title, I used the White Script ABC/123 Stickers, but I customized them by coloring them with my Blue and Green Dual-Tip Pens, blotted and blending the colors until they were close to the shade of the greenery. I love the watercolor effect it created! I wanted to feature more than one photo in this layout, so I used the 2” x 2” square to trace and cut out several smaller photos and I mounted them beside the 4” x 6” focal photo. I finished it off by journaling directly onto the patterned paper and made some faux stitches with my Black Dual-Tip Pen. I love how this wreath turned out – so pretty! Finally, I decided to put some of the rest of my colorful Dual-Tip Pens to good use and do some tracing & doodling! I used some painters tape to secure the template and a piece of White Cardstock to my work surface. Then I traced each space on the template directly onto my cardstock with the bold-tip of the pens. I filled in the rays with tiny dots (clustered together near the centre to look as though they were dissipating as they moved outward) and the circular shapes with straight lines. Then I added my son’s 5” x 7” school photo along with his name, grade and school year in Black Script ABC/123 Stickers. What a bright, fun layout for his school years album! (And it was SO much fun to make!) If you want even more tips on using this versatile tool, take a look at this video! 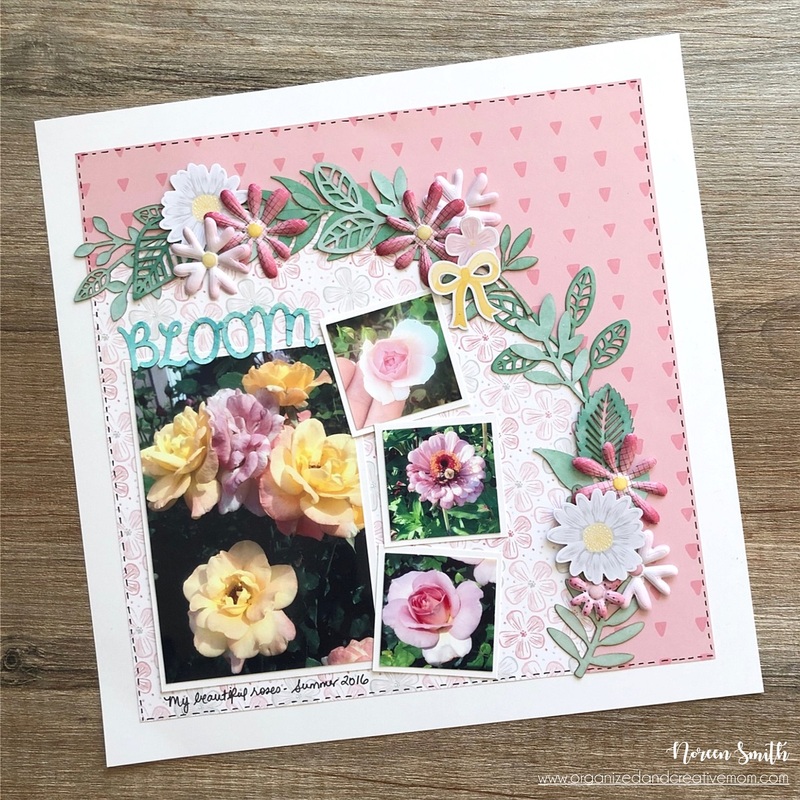 I hope you get a chance to play with the Collage Wreath Recipe Template as well as the beautiful Blend & Bloom Collection! All Creative Memories products featured in these projects are available in Canada on my CM website, and you can find advisors in the US and other countries by using the Advisor Lookup feature. Please drop by my blog, Facebook group, YouTube Channel or my Instagram feed for more ideas and inspiration – I create layout sketches, cards and other projects which showcase Creative Memories products & tools on a regular basis. You are amazing! I loved the video, and then got even more great tips from the article. A wealth of helpful information. Thanks! Such a great tool! Loved how many options you shared!